Tagged under Yuu Watase, Studio Pierrot, Series, Light Novel. Aya Mikage's world is turned upside down on her sixteenth birthday, as her family turns to kill her. The Mikages are wealthy, intelligent and elite humans, due to the introduction of Tennyo (Celestial Maiden) blood into the family. She discovers that her Tennyo ancestor (Ceres) was not only living in their hearts and souls throughout the ages; in fact, her very ancestor is living inside her, to destroy the Mikage family, and to find her feathered robe (hagoromo) in order to fly back up into the heavens. As Aya loses her family connections and distances herself from her twin Aki and other Mikages to prevent Ceres from taking lives, she meets a mysterious man named Touya, who seems to possess superhuman attributes. Who is he? Will Ceres return? What is inside Aki? Ayashi no Ceres is seriously heavy stuff. There are bits where there is light humour to kill the tension, but that is seen very rarely throughout the anime, and it is an anime to be taken quite seriously. Ayashi no Ceres originated from the fairytale of the tennyo... so there is no surprise that there was actually a catalyst for the foundation of this anime. With all the characters, they all have a kind of inner flaw- Ceres who is blinded by hate, Aya who is unable to cope with facing the truth that she is a tennyo and the break up of her family, Touya being unable to communicate feelings, Yuuhi who is rash and jumping to conclusions, and Aki being too innocent. Aya Mikage has a fraternal twin named Aki visited their grandfather during their 16th birthday to test if they have enough angel or celestial maiden blood in them. Unbeknownst to them Aya is the reincarnation of a very powerful celestial maiden named Ceres. Aya not knowing this was placed into many llife threatening danger, many of these dangers coming from her own family. According to legend, Ceres will annihilate the entire MIkage Clan for revenge upon stealing her celestial robe, preventing her from returning to heaven. Meanwhile her twin brother Aki was completely taken over by the soul of "Mikage" the vengeful and hateful spirit the original ancestor of the Mikage's who was the one who stole Ceres' celestial robe forcing her to stay in Earth with him. Not only does Aya has to fight off her family to save herself, she also has to stop herself from falling in-love with Toya, a servant of the Mikage who was also out to kill Aya. In order for Ceres to not kill the Mikage Clan, Aya promises Ceres that she will help her in finding her celestial robe, but all is not done in simple words for Aya as her brother is set out to kill her himself. It's a very emotional Anime, especially Ceres' story is sooooo sad ;_; I really love the whole story and how it develops, and although there are some episodes that are rather dull to me, it never gets boring to watch this Anime again and again :D My favourite character certainly is Ceres, and she still is one of my all-time-favourite characters! She's just so cool and yet went through much pain. I think it was one of the first anime i really owned completly. 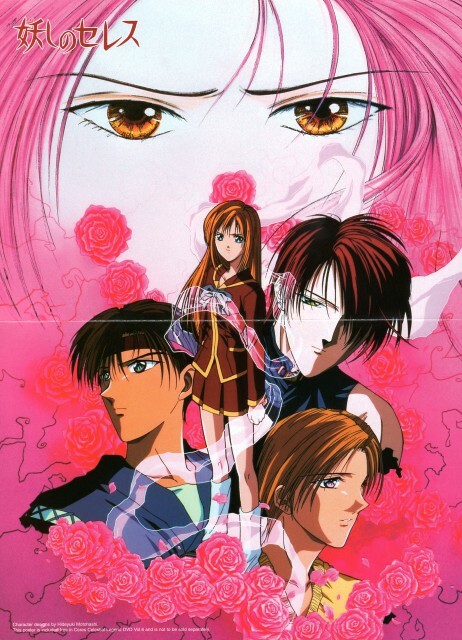 In my opinion, Ayashi no Ceres is better than Fushigi Yugi... less romantic, maybe. There's more suffering and cruelty (not a lot). However, the drwaing is not as good as it is in Fushigi Yugi. The story is shorter and there're no OVAs. The plot is very good. In fact. i realy like japanese myths and this anime is about one of them; about a godess whose shawl is stolen. She must stay in the earth till she finds the shawl. Cause she's not able to find it, the godess is reborn in every generation of her family in order to bring her shawl back. Of course, the anime is more complicated than the legend but i will not make any spoiler here ^^, you'll have to see the anime if you want to know what happens. I watched this anime because I loved the manga. This is a decent adaptation, except that they cut out my favorite character Shuro! Her role in the series is relegated to like a 5 minute chunk towards the end of the series. Granted they had to cut a lot of stuff out in order to fit the anime series into one season, but I feel that in doing so a lot of what made me love the manga was lost. Wow! Ayashi No Ceres has to be the best anime of Yuu Watase. It is darker than Fushigi Yuugi so I've heard and read on reviews. The characters are just amazing, the plot is epic and the story will keep surprising you as it goes. The art and animation is beautiful, I love Yuu Watase's style of art - I'm pretty sure its those eyes. That's how you can tell of the difference in many of the artists' styles - the eyes of course. The ending is tragic and happy at the same time, you'll love it.